Initiatives in Design and Development | Environmental Initiatives | Corporate Social Responsibility (CSR) | Akebono Brake Industry Co., Ltd. The use of brake friction materials generates brake dust. In North America, regulations on environmentally hazardous substances have been tightened due to anxiety over the impact of brake dust on the ecosystems of rivers and gulfs. In response, Akebono is striving to develop technologies that reduce the volume of brake dust generated from friction materials while extending the product life of brake pads. It is also conducting research to create methods to analyze and evaluate brake dust. Also, Akebono promotes the development of products with a lower environmentally hazardous substance content. In accordance with in-house guidelines, which set forth stricter regulations on brake raw materials than required by law, Akebono painstakingly examines these materials' possible impact on the environment and work environment from the product design and development stages. We avoid using materials that fall under the category of environmentally hazardous substance and when it is determined that a substance has a significant impact on people and the environment, we use alternative materials. 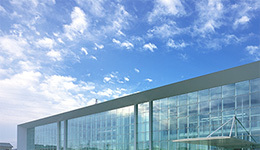 The Research & Development Centre develops friction materials that reduce environmental impact. 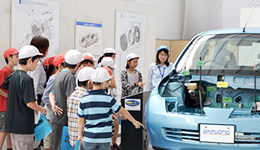 Based on the material technology, the Centre develops new materials which can be applied in new fields other than brakes. 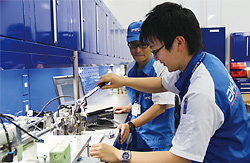 Akebono seeks to establish an advantage by differentiating itself from its competitors. 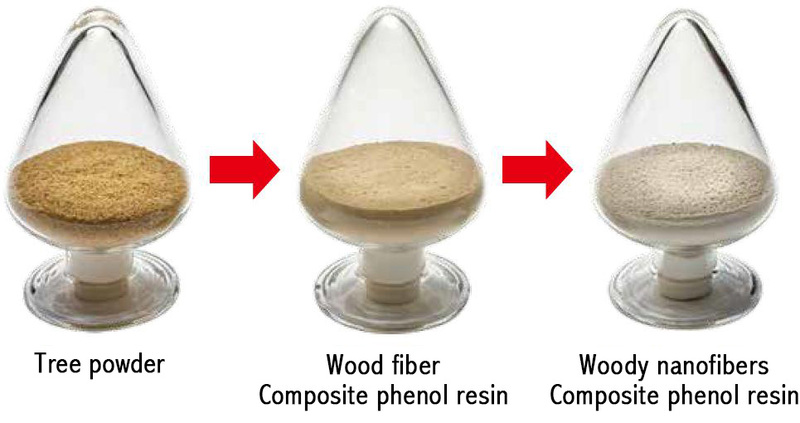 For example, as Akebono’s original material, the R&D Centre succeeded in developing phenol resin with wood powder. A special feature of this new material is that fibers miniaturized to nano size based on coniferous wood powder are uniformly dispersed in phenol resin. The new material makes it possible to achieve greater strength in the brake’s operating temperature range than with conventional phenol resin. As a result, the new material helps improve the wear resistance of brake pads and improves noise and vibration (NV characteristic). 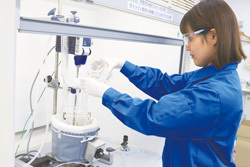 In addition, Akebono has developed inorganic particles with unique shapes as its new material for new business fields. This material is a uniquely shaped particle that draws fully upon synthetic processes cultivated in material development for brake friction materials and cannot be stably obtained by usual methods. We are working on developing various fields of application by controlling the physical and chemical properties resulting from this unique shape. 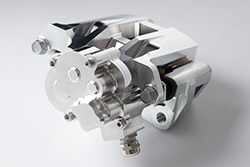 At the Akebono Research & Development Centre, we are conducting research and development into magneto rheological (MR) fluid brakes that eliminate brake dust. This product accommodates the increasing use of electro-mechanical systems in automobiles and is environmentally friendly. A functional material that has been researched since the 1960s, MR fluid has the characteristic that it changes from a liquid to a semi-solid state in reaction to magnetism. 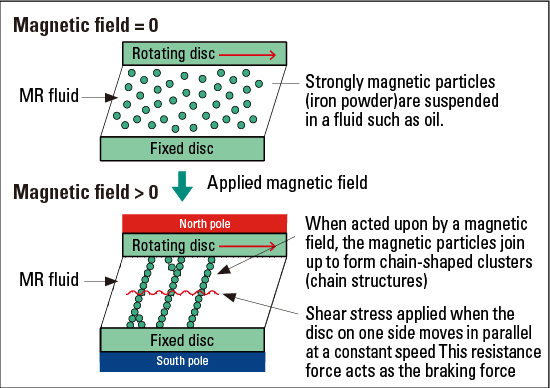 When a magnetic field is applied, the strongly magnetic particles (iron powder) several microns in diameter suspended in the fluid align with the direction of the magnetic field, forming chain-shaped particle clusters that change the fluid to a semi solid state. MR fluid brakes are constructed with a space filled with MR fluid between a disc fixed to the vehicle and a disc that rotates together with the wheel hub bearing. When electricity is passed through a magnetic coil mounted inside the brake, a magnetic field is generated in an orthogonal direction to the discs, causing chain-shaped particle clusters to form between the fixed disc and the rotating disc. As the rotating disc continues to rotate, the chain-shaped particle clusters are broken by shear stress, and then form connections to the neighboring cluster, before being broken again in a repeated cycle that generates a resistance force on the rotating disk. This resistance force is the braking force. Using MR fluid for brakes can reduce the emission of environmentally damaging substances by eliminating abrasion powder because the brakes do not wear. Moreover, MR fluid responds to a magnetic field in less than a micro second, enabling sensitive and stable braking. Since the voltage (excited magnetic force) is electronically controlled, users can select their preferred brake feel from among several preset patterns. 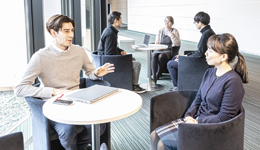 In collaboration with the Institute of Fluid Science, Tohoku University (Professor Masami Nakano), Akebono conducted research and development on ultra-compact mobility and completed its prototype product in March 2015. We will continue to test and improve MR fluid brakes as a smart brake suitable for smart cities and smart mobility, aiming for implementation in 2020. Akebono supplies rotors for trucks produced by U.S.-based General Motors Company. These rotors are finished using the ferritic nitrocarburizing (FNC) process and thus deliver superior braking performance as well as low noise and vibration while boasting an industry-leading product life, which, in turn, contributes to resource savings. Moreover, since FNC finishing provides greater abrasion resistance, it also reduces the generation of dust, which not only often mars the appearance of wheels, but poses an environmental burden. In the U.S. states of Washington and California, state laws have been enforced regarding restrictions on chemicals contained in automotive brake friction materials to prevent the impact of emissions of such substances on river and marine ecosystems. In the state of California, restrictions on copper will be enforced from 2021, and from 2025 onward, it will be illegal to fit new vehicles with friction materials containing 0.5% or more of copper. Conventional friction materials have used copper to ensure safe and effective performance at high temperature. Akebono developed copper-free friction materials and started to market them for aftermarket products in 2007 and supply them as OEM parts to automakers since 2014. By combining multiple component materials, Akebono achieved the same performance as copper contained pads while keeping the cost at the same level. 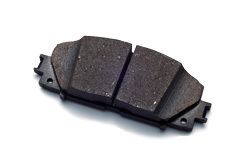 Around 80%* of Akebono brand aftermarket brake pads have a copper content that is lower than the 2025 standard for the state of California. Furthermore, we are also working to quickly develop antimony-free materials, as these could potentially be targeted under future regulations. Akebono will continue to comply steadily with laws, including Washington state laws going forward. Electro-Mechanical Brakes employ an electric operating mechanism to press the disc brake pads. There is no need for hydraulic piping making the vehicle lighter, which in turn improves fuel efficiency. They are also　environmentally friendly because they do not use brake fluid, which must be properly disposed of whenever repairs are made. Low drag calipers incorporate specially designed components to ensure that pad to rotor gaps are optimized at the micron level. This reduces brake drag due to contact between the pad and rotor when the brake is released, contributing to improved fuel economy. Since 2007, Akebono has been supplying its brake systems to the McLaren Formula One racing team. To satisfy McLaren's requirements, Akebono developed technologies that improved the structure, materials, surface finishing and other aspects of its products and worked to enhance the reliability and stability of its brakes to the greatest possible extent, even pursuing a few thousandths weight reduction as well as high rigidity and outstanding cooling performance. 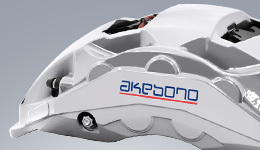 Striving to develop competitive brakes for use in Formula One, the FIA World Endurance Championship and other prestigious motorsports, Akebono will continue to achieve technological breakthroughs and reflect them in the creation of products for mass production. For example, our weight-saving technologies will help enhance fuel efficiency and thereby contribute to lower energy consumption for automobiles. Furthermore, by participating in endurance racing, we will advance technologies for the greater wear performance of brakes in heavily loaded conditions. This will, in turn, help us create products with a longer life while helping to save resources. We are supplying mass-produced products incorporating these technologies to luxury car manufacturers in Europe. In addition, Akebono is developing copper-free brake pads for use in high performance vehicles in response to U.S. regulations. Looking ahead, we will launch brake pads that simultaneously achieve superior braking performance and environmental-friendliness for mass-produced vehicles. Moreover, we will go on to supply more environmentally friendly products even in the field of high performance vehicles. When it comes to making brakes, finding ways to control the noise and vibrations that may make the driving experience uncomfortable for the end-user is of the utmost importance. Noise refers to the sound generated when vibration caused by the friction between the pads and rotors is transmitted through the calipers and resonates throughout the brake. 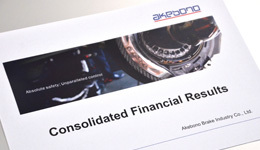 There are various other phenomena that may affect driver comfort, and Akebono pays particular attention to what it calls NVH (noise, vibration and harshness, the latter being a rough sound caused by unevenness in road surfaces or squeaking at low speeds), which makes for a less comfortable braking experience. Noise and vibration are affected by many factors, including driving conditions and previous travel, speed, brake temperature, material and form of components, and rotor wear. Countering these factors requires extremely advanced technology. To counter noise, which is particularly challenging, Akebono uses a computer simulation called Complex Eigenvalue Analysis. By reflecting various factors related to noise and vibration in the simulation to increase its accuracy, the Company can implement countermeasures at the design stage before actually making the brake, thus reducing the number of prototypes needed and contributing to both energy and resource savings. Akebono has also undertaken analysis of field data and laboratory test results into the vibration phenomenon known as “judder,” in an effort to understand the mechanism that causes it. By feeding the analysis results back into an optimal brake component design, the Company aims to prevent the phenomenon. 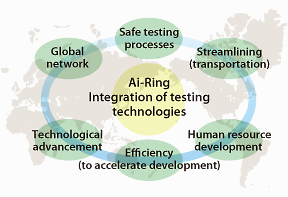 Akebono's proving ground, Ai-Ring, is one of the largest operated by an automotive parts maker in Japan. The facility was badly damaged in the Great East Japan Earthquake of March 2011. 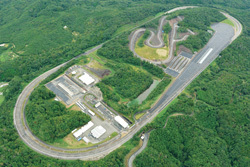 The high-speed circuit was subsequently restored in 2012, and in October 2016, the Company added various new types of test tracks, including a new winding road, a comprehensive rough-road evaluation track, and slopes. We also expanded our dynamometer testing facilities (brake testing machines) to help ensure safety as a top priority from the design stage, and held a ceremony to mark the completion of the expanded facilities. This has enabled us to conduct comprehensive brake testing from bench testing, through dynamometer testing, to vehicle testing in a single facility, thereby speeding up our development. It also enables a development flow that allows engineers to be involved in evaluation throughout the entire process, and we will use it as a human resource training site to help associates deepen their knowledge about driving skills and vehicle construction and functions. The automotive industry is rapidly innovating the technologies of electrification and autonomous driving in response to global environmental issues and the need to improve safety, among others. Akebono will develop brake specialists who combine a deep knowledge of vehicle construction and functionality with a sensitivity to respond swiftly to social changes. These human resources will increase our competitive advantage in the area of development. In addition, at the end of 2017, we plan to construct a database that will centralize our global evaluation techniques and produce our evaluation result history and NVH*-related information when needed. 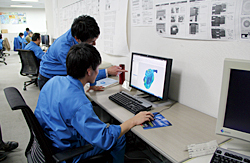 Akebono will continue to increase its evaluation capabilities by using actual vehicles and enhance its NVH analysis and simulation technologies as it actively engages in development of new products. Moreover, the Company reused 100% of the trees that were cleared to construct the test course expansion, turning them into wood chips and spreading them on slopes to control soil erosion. In this way, we achieved zero-emissions. We also installed a 40 kW total capacity solar power generation system on-site. This will supply areas with facilities that use a lot of power, such as large dynamometers. In addition, some of the power will be stored to provide seven hours of power to network server, fluorescent lighting, and power sockets within the office in the event of a power cut. * NVH: Noise, vibration and harshness, Akebono refers to the various phenomena that may cause an uncomfortable braking experience as NVH, and takes measures to counter them.